Speaking to ABC News, John Lauro weighs in on the judge’s order denying the request by Stormy Daniels for expedited trial. Speaking to Fox News, John Lauro weighs in on Michael Flynn’s guilty plea withdrawal. Interviewed by NBC News, John Lauro comments on James Comey’s testimony and the legal standard for obstruction of justice. On Friday, April 21, 2017, the US Supreme Court will meet in conference to consider a pending petition for certiorari in Farha v. United States, No. 16-888, a major white-collar fraud case raising an important issue of concern to the defense bar and their clients: whether “deliberate indifference” is a sufficient level of mens reafor proving “knowledge” with respect to federal criminal statutes. On Friday, March 17, 2017, John Lauro led a panel discussion regarding the use of experts in criminal litigation, as part of the White Collar Lawyers College sponsored by Stetson University Law School and the National Association of Criminal Defense Lawyers. The panel focused on the effective use of expert consulting services and testimony in complex criminal trials. President Donald Trump nominated Judge Neil M. Gorsuch of the Tenth Circuit Court of Appeals to fill the U.S. Supreme Court vacancy created by the death of Justice Antonin Scalia. By all accounts, Judge Gorsuch is a brilliant jurist with exactly the right qualifications and temperament to be a Supreme Court justice. On Friday, February 19, 2016, John Lauro was one of the featured speakers at a program sponsored by Stetson University Law School and the Tampa Bay chapter of the Federal Bar Association. The topic was corporate criminal law and recent developments relating to overcriminalization. The speakers included criminal defense lawyers, as well as academics from U.S. and foreign law schools. Mr. Lauro spent considerable time discussing the impact overcriminalization has on individual clients, and his experiences as defense counsel on the WellCare case. The program was organized by Professor Ellen Podgor of Stetson, and brought together academics and practitioners for an informed dialogue about trends in corporate criminal enforcement. John Lauro was featured in an article recently published on The New York Times. The article focused on the Dewey and LeBoeuf case and the overcriminalization of civil infractions. Mr. Lauro and the panel explored the root causes of overcriminalization, including the political pressure on Congress to address every social issue with a new criminal law. The panel also considered how federal prosecutors use broadly worded statutes to prosecute alleged civil violations. Mr. Lauro spoke about his role in the U.S. v. Clay case, where he represented a former CFO of a public company who was accused of health care fraud for a reasonable interpretation of a regularity framework in Florida. That case has now become a leading example of the overcriminalization problem. The two-hour CLE panel is available for on demand viewing at the Federal Bar Association’s website. Continuing his efforts to raise awareness of the scourge of overcriminalization, on July 28, 2015, John Lauro was the featured presenter of a teleforum discussing the topic of “Criminalizing Reasonable Interpretations of Regulatory Schemes: Clay v. United States.” The Federalist Society’s Criminal Law & Procedure Group sponsored the event. Mr. Lauro was one of the lead lawyers who tried the Clay case, where executives were prosecuted under federal law for their reasonable interpretation of a state healthcare regulatory scheme. What began as a highly-publicized raid by some 200 FBI agents on a Florida health care company ended as a criminal prosecution over a reporting dispute that concerned the interpretation of a provision in Florida’s Medicaid contracts, where the State itself had declined to enact clarifying administrative regulations. The one-hour teleforum is available for on-demand listening at the Federalist Society’s website. On April 20, 2015, John Lauro launched his blog entitled C-Suite Defense. Mr. Lauro’s blog is focused on emphasizing how criminal law works at the C-Suite level and how ordinary business judgments can be turned into federal and state crimes. The blog is accessible at www.c-suitedefense.com or directly from Mr. Lauro’s website. The Lauro Law Firm has been recognized as a 2015 Sustaining Law Firm supporter by Bay Area Legal Services. Bay Area Legal Services provide free civil legal assistance to qualified low-income residents and nonprofit organizations throughout the Tampa Bay area. For more information about this organization click on the link to the Bay Area’s website. On March 14, 2015, John Lauro was a member of a panel discussion at the annual White Collar Criminal Defense College, sponsored by Stetson University Law School and the National Association of Criminal Defense Lawyers. John’s panel dealt with filing pretrial motions to frame a criminal defense at trial. He particularly focused on challenging government experts, as well as uncovering critical information for the defense. John was adamant about demanding that prosecutors provide all relevant information to the defense, including so-called Brady material where government prosecutors have information that exculpates defendants and confirms innocence. 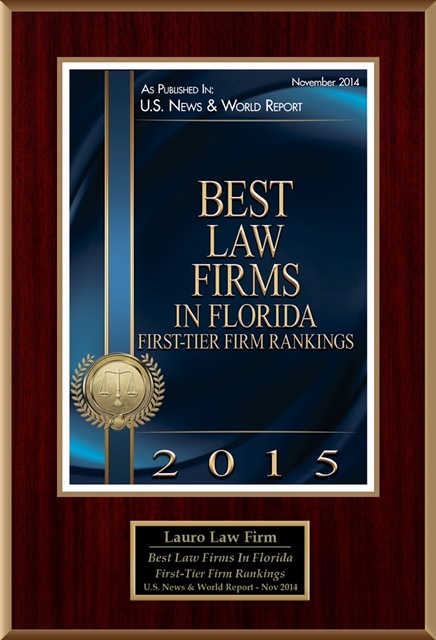 Lauro Law Firm has been ranked in the 2015 U.S. News & World Report “Best Law Firms” rankings. Lauro Law Firm received Tier 1 rankings in Tampa for the “Criminal Defense: White Collar” practice area. In partnership with Best Lawyers, the U.S. News & World Report rankings are based on a rigorous evaluation process that includes the collection of client and lawyer evaluations, peer reviews from leading attorneys in their field, and review of additional information provided by law firms as part of the formal submission process. 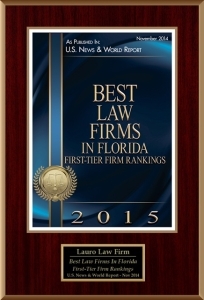 The 2015 rankings are published online at http://bestlawfirms.usnews.com. John Lauro was featured in an article recently published by Fraud Magazine, a publication of the Association the Certified Fraud Examiners. The article focused on the use of certified fraud examiners in criminal litigation, and the importance of coordination between counsel and experts. 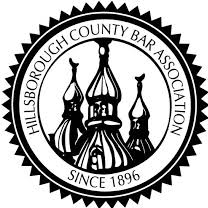 John Lauro was a featured presenter for the Hillsborough County Bar Association’s Corporate Counsel Section meeting held on May 22, 2014. Mr Lauro spoke extensively on the topic of Corporate Counsel’s role in protecting the company and it’s employees during a criminal investigation. John Lauro was a featured panelist and moderator at the National Association of Criminal Defense Lawyers White Collar Crime College held on March 20, 2014 at Stetson University College of Law. Mr. Lauro lead a panel discussion of the importance of retaining and using experts in complex white collar criminal matters, including how experts can be used at trial. The panel focused on critical issues regarding maintaining the confidentiality of consulting expert work product and how experts can assist counsel in understanding complex subject matters such as accounting, medical economics, and finance. Finally, the panel addressed expert witness preparation and the need to explain complicated factual material to jurors. John F. Lauro along with Ernest Dixon, an expert consultant who advises health care clients regarding accounting and financial reporting, presented a panel discussion on the substantial increase in criminal enforcement of health care laws and the complex challenges for managed care companies and their employees. Mr. Lauro and Mr. Dixon spoke extensively on the topics of how managed care companies deal with criminal enforcement issues from the investigative phase to trial. The presentation also addressed how criminal enforcement of the health care laws is affecting all facets of the industry. John Lauro was one of the featured panelists at the Federal Sentencing Guidelines Seminar in Orlando, Florida on May 6, 2011. The seminar was sponsored by the American Bar Association and the National Association of Criminal Defense Lawyers. Mr. Lauro led a panel discussion of developments in sentencing for federal health care offenses. A significant part of Mr. Lauro’s practice deals with representing health care providers, physicians, and payers in connection with federal health care matters. The panel discussion focused on the increase in enforcement actions by the federal government that will affect all individuals and businesses in the health care industry. On May 3, 2011, John F. Lauro was awarded the prestigious James H. Kynes Memorial “In The Trenches Award” by the Hillsborough County Bar Association. The award recognizes excellence and integrity in criminal advocacy, and is given annually to a lawyer who provides exemplary representation to clients in the criminal justice system. Mr. Lauro was recognized for, among other things, his successful representation of the former president of Medical Manager Corp. (now WebMD). A federal judge has overturned a guilty verdict against two former Tampa businessmen, saying the statute of limitations had expired in the fraud case. Saying Thomas E. Stringer Sr. has already endured the public humiliation of losing his judgeship and law license, a federal judge on Friday ordered him to spend one year under supervision and to pay a $250 fine for bank fraud. Stringer, a former appeals judge, admitted in August that he lied on a loan application for a Hawaiian residence he bought with a stripper. But Stringer avoided any prison time for committing federal bank fraud to help a stripper he had known for years. Instead, he was sentenced to a year of probation, ordered to forfeit $222,000 and fined $250. In November 2007, former NBA referee Tim Donaghy pleaded guilty to betting on NBA games, including games that he officiated, as well as providing confidential information to others who bet on NBA games, a serious violation of NBA regulations. For four years, Donaghy placed personal bets on NBA games, and for at least five months he advised gamblers on which teams to pick by providing information about referee assignments, health of players, and relationships between referees and players. He was paid to make picks on the games, initially netting $2,000 for each correct pick and later he earned up to $5,000. By committing these crimes, Donaghy has brought into question the NBA’s ability to monitor and regulate their referees. John Lauro, his lawyer, stated that he believed Donaghy’s actions were based on a gambling addiction that went untreated for too long. Donaghy faces up to 25 years in prison and up to $500,000 in fines. 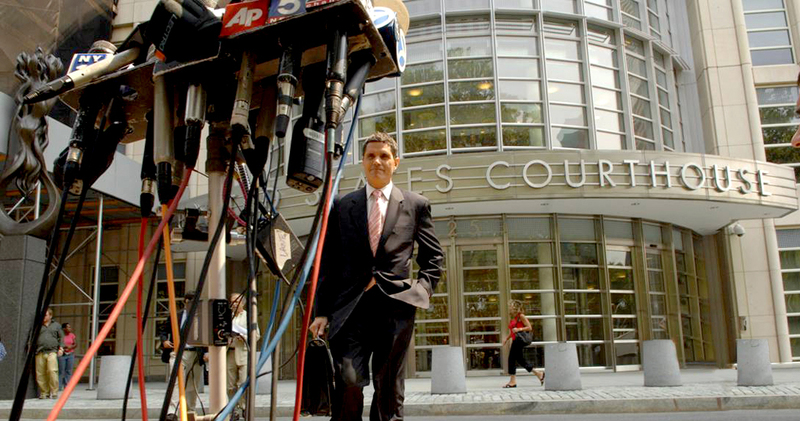 Many of lawyer John Lauro’s cases involve white collar crimes; because of this, he is often presented with the question of whether his client is legally guilty. For Lauro, that question doesn’t matter. The New York and Tampa-based lawyer doesn’t allow it to affect his ability to work professionally and to the full extent of his knowledge and resources. Over the last several years there has been a dramatic change in the practice of white collar criminal defense. The highly publicized corporate scandals involving Enron, WorldCom, and others, and the federal government’s reaction to those events have resulted in an enormous shift of power away from protecting corporate employees’ rights. After the passage of the Sarbanes-Oxley legislation and the Justice Department’s issuance of the so-called Thompson Memorandum, the focus has been on enhancing the power of big government and protecting the existence of big corporations.